Le Démantlement is a story of hard decisions and an uncertain future. 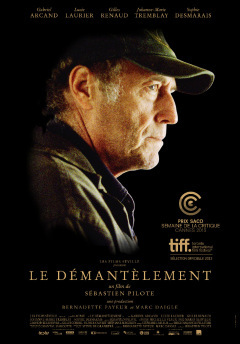 Featured on the cover of the Rendez-Vous French Film Festival program, Le Demantèlement is a melancholic drama about sheep farmer Gaby Gagnon (Gabriel Arcand) whose way of life is lost when he decides to sell his farm in order to help his daughter financially. This transformation is very emotional as he has to auction off his life’s work, give up his dog, and rent an apartment in the nearby town. Awash in the golden glow of the rolling hills of the Gagnon farm, this film is beautiful and bittersweet. After his two brothers wanted nothing to do with the farm that their father left behind, his two daughters moved to Montreal, and his wife left him, all Gaby had left was his dog and his farm. He seems content in his routine of tending to the sheep, walking the land, and living a relatively simple life. He goes into town when he needs to and has little interaction with anyone except his friend who helps out with his bookkeeping. It seems that the farm is Gaby’s life and nobody he knows can imagine him ever selling, even though so many farms around him are being auctioned off. When his daughter Marie (Lucie Laurier) and two grandsons come for a visit, she tells him she has left her husband and asks for money to buy out her husband’s half of their house in Montreal. It is heart wrenching to watch as Gaby visits the bank and learns that the only way he can give his daughter the money is to dismantle the farm. He is determined to provide for his daughters and proceeds to make the arrangements for an auction at his farm. Frédérique (Sophie Désmarais), his other daughter, visits during this time and comforts him, but doesn’t stay long as she must get back to her acting career in Montreal. There is a sense that his daughters are simply using him as Gaby resigns himself to the fact that he will spend the rest of his days in a tiny apartment, never tending to the sheep again. Gaby makes it clear that his life is not his farm, but his daughters and he will do whatever it takes to help them in any way he can. He says that he doesn’t mind if they use him; that’s what he’s there for. The farm, almost a character itself, is what has been a burden all his life, explains Gaby. I found it hard to know how to feel about the dismantling of Gaby’s farm. On the one hand it was tragic to see his way of life disappear before his eyes, but at the same time selling the farm would lift a burden of responsibility and allow him the freedom to pursue other interests and pick up and leave for a weekend if he felt like it. Gabriel Arcand delivers a subtle performance that is perfectly melancholic and along with the stunning backdrop of the countryside, Le Démantlement is a story of hard decisions and an uncertain future.